This stock photo includes the view from a section of the boardwalk through the Rainforest Trail between two western redcedar trees (western red cedar), Thuja plicata, in the coastal rain forest of Pacific Rim National Park, Long Beach Unit, Clayoquot Sound UNESCO Biosphere Reserve, West Coast, Vancouver Island, British Columbia, Canada. Looking up toward the sky, this picture shows the vast height and mass of these trees that make up this important area of old growth forest in North America. Pacific Rim National Park is located along the Southwest coast of Vancouver Island. The 49,962 hectares of protected park (half on land, half marine) stretches 125 kilometers along the coast line from Tofino to Port Renfrew. This park has been further divided into three geographical units; Long Beach, Broken Group Islands and the West Coast Trail. Much of Pacific Rim National Park is coastal bog forests and marginal old-growth forests with stunted trees. 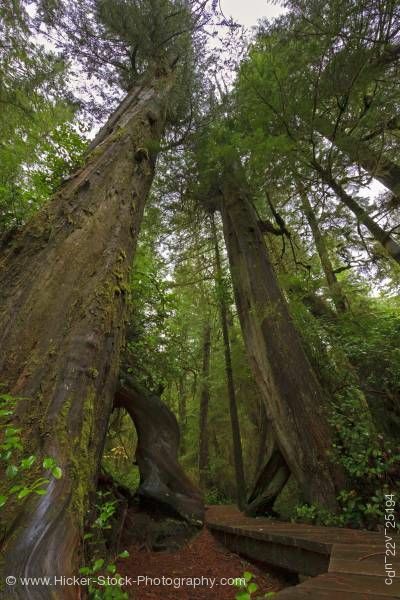 However, there is an exceptional tract of productive old-growth forest in the Nitinat Triangle portion of the park’s West Coast Trail unit, which includes Canada’s most massive tree, the Cheewat Redcedar. The Long Beach Unit has a few nice stands of ancient redcedars. The Sitka spruce fringe that lines the entire outer coast of the park contains many large, towering ancient spruce trees.